Dentures are often given a bad rap, but, they can offer freedom, independence and self-confidence to patients who have lost all their teeth or are about to lose their last remaining ones. Deciding to get dentures is a big step. Dentures enable you to better enjoy life. They also come with great responsibility and sometimes a high price tag. Many people think that dentures are fake, replacement teeth. While they are prosthetics teeth devise that mimics the look, feet and functionality of teeth, they are essential for patients who have no teeth remaining. Real, natural teeth are anchored into the jawbone, which keeps them securely in place. Dentures on the other hand, are not fused with the gums or jawbone, but rests on top of teeth. Because of this, dentures are not as secure as natural teeth or other dental treatments. What is the Process of Getting Dentures? Patients who get full dentures either have lost all their teeth or their remaining natural teeth are in such bad shape that they will need to be extracted. Depending on your unique situation, either one of our dentists or staff members will extract the teeth in the office or refer you to an oral surgeon to have many teeth pulled. During the weeks that your gums heal, we’ll give you a loose-fitting immediate denture to wear. This denture is to merely preserve the structure, strength and density of your jawbones. When your gums completely heal, we will then take molds of your gums which will be used as the foundation of your permanent dentures. This mold is then sent to a dental lab which will manufacture your new dentures. Once the new dentures arrive, you’ll come in and be fitted with your new dentures. As you’re trying them on, we’ll make all the adjustments necessary until you’re completely satisfied with the look and feel of your new dentures. 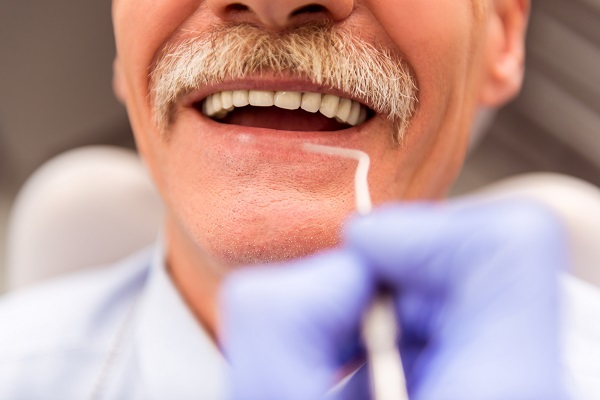 We’ll inform you on the best care for your dentures and schedule regular follow-up check-ups. Typically, patients will need major adjustment to their dentures or even need a new set of dentures after every 5 years or so. What Happens if the Dentures Don’t Fit? Good-fitting dentures are crucial in effective denture treatment. Dentures can be painful and cause a lot of discomfort and embarrassment if they don’t fit properly. To better ensure patients will continuously wear and enjoy their dentures, they must fit perfectly. If your dentures are loose, too tight or cause you pain and discomfort, have them adjusted by one of our office staff members immediately. We will adjust your dentures to the point where you’re comfortable and satisfied with how they fit, look and feel. It is not uncommon for denture patients to come back every three years or so to have their dentures “relined.” If you’ve had dentures for a long time, we may recommend a brand-new set as dentures do weaken and wear out over time, decreasing their effectiveness and their fit. What are the Top Concerns? Getting dentures is a big deal. You’ll have to get used to some changes. You’ll once again have a great smile and the ability to eat and speak clearly. You will, however, need to be mindful about the care of your dentures. How Long is it Until One Gets His or Her Dentures? Getting one’s final denture may take a few months. Patients who have remaining teeth that need to be extracted will need to wait longer to be fitted with their final, permanent denture as their gums will need more time to completely heal than those with only a few teeth getting pulled. We’ll apply a loose-fitting, temporary, immediate denture into the patient for the 6-8 weeks it takes for their gums to completely heal from the tooth extractions. The purpose of this is to preserve the density and stability of the jawbones which are now unsupported by teeth. The real, permanent dentures won’t be inserted until after the patient’s gums completely heal. Once the patient’s gums heal and the dentures are made, the dentist will apply the permanent dentures. The patient will try them out for comfort and proper fit. The dentist will adjust the dentures to ensure the patient is comfortable and has the best-fitting dentures possible. Occasional follow-up appointments may be required to make adjustments. Are Dentures Covered by Insurance? Most insurance plans cover part of the denture costs. Most will cover either the immediate dentures right after tooth extraction or the final set of dentures. Most plans have limitations on replacement dentures such as only paying for lost or failing dentures every 5 years. Don’t let the lack of knowledge of dentures keep you from living and enjoying life to the full. Contact us at Grove City Dental in Blackfoot, Idaho and we’d gladly discuss any questions or concerns you may have about getting dentures. Do You Have a Missing Tooth? Our goal is first to listen, then to deliver individualized, uncompromised care.